I always like finding different Tree ears around to see what interesting ones there are. So the boys are working on becoming a dance troop? Delightful post, as ever, Lisa. I'm a bit worried that there's a fungus among us, but it is pretty. So maybe it isn't so dangerous. And your boys keep you constantly interested. Which is great! Beautiful pic of the fungus. I am so glad you are recording these cute things your boys do and say in your blog. This will be so fun for them one day to look back and read this. The J word did stump me! No shopping for me either!!! That fungus is pretty; reminded me of a butterfly. Your boys continually amaze me, Lisa. And, the J word? Hilarious. I love that your boys are aware that naughty words shouldn't be spoken at school or anywhere else. My granddaughter learned that lesson when she spent time with pencil and paper writing "I will not swear at my sister" 500 times after an exchange with her sibling that was overheard by her Dad! No shopping for me either. Your lovely fungus looks like a colorful UFO. Cracking up at the boys and the 'pulling of my leg' comment. 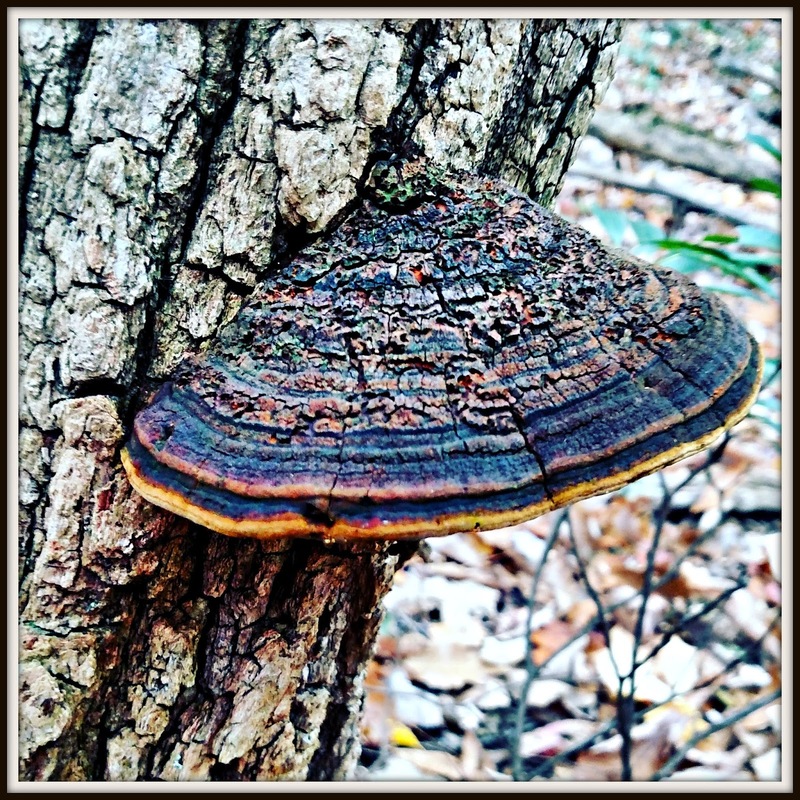 That is one beautiful fungus! Never thought I'd say that!!! Love the stories about the boys. I don't shop today either although I did find a few deals online today. No Black Friday shopping for me. Yuck!! You can find the Just Dance on Youtube. Sometimes if my 2nd grade class cannot go outside I have them get up and dance along. They love it. That's a very strange fungus. Looks like something from "The Day of the Triffids." My son doted on game machines from their inception. The first one he had was a Sega Genesis. He was about 10. When Sonic the Hedgehog fell of the logs and sank into the deep blue water my son used to shout with anger! We've gone through all those things, I don't know what he has up in his apartment now but I am sure it will be the best available. He and his set are very much into the gaming thing, where you play against people all over the world. I always like the moss and fungus. My oldest is 16, my youngest is 11 and we only have an outdated Wii. No other game system and my kids seem well-adjusted. Stay the course! It's worth it! That is the most beautiful fungus we have ever seen. We have some here,, but they are cream color and shades of brown. Your boys are precious.. and we love hearing about your world with them. Gorgeous fungus! Yeah, I was puzzled by the J word too. We don't have a big game system either. The boys do have 1 little DS system. I sometimes take that with us when we go to art galleries. It would be fine if we'd just go through the gallery, but Dad has to talk to people. I would have thought the "J" word would be Jerk. I could see how some would think that some may see that as a bad word. I didn't go black Friday shopping either. I love the deals, but I don't like the aggressive shoppers! I had someone try to steal an item out of my cart one time! Just got in from toy shopping at the Fleet Farm store. Pretty light crowd, I had 2 grandkids tagging with me as consultants. I think you can take any word and spin it as a bad one. I would learn new "lingo" every single day when my kids were in middle and high school. Seems everyday words change connotation consistently. I didn't guess the jackass term and honestly, I was relieved when I read it. Oh, it could have been so much worse! Me either. I'd rather hunt up fungus like you. Jackass is one of my favorite words; I use it often. Did you know there's an international fungi society that uses them to dye fiber, textiles, etc? They meet every few years, not annually. For the first time ever, I shopped both Thanksgiving day, twice, and on black Friday and had a blast! People were kind, considerate, friendly, talkative, helpful...it was a ton of fun and I bought a little electric fireplace heater for my '67 Scotty camper as well as a new sewing machine. Woohoo! But I won't try shopping on those two days in an urban area as I value my life and sanity.